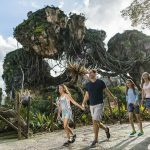 Fun and adventure awaits guests at ‘Pandora – The World of Avatar’, an entire new land opening to the public on the 27th May 2017 in Walt Disney World in Florida. Pandora – The World of Avatar is the largest ever addition to Disney’s Animal Kingdom Park, one of the four Theme Parks in Walt Disney World in Florida. It features a mystical world of floating mountains, bioluminescent rainforests and breathtaking new experiences that spectacularly come to life in the evening. 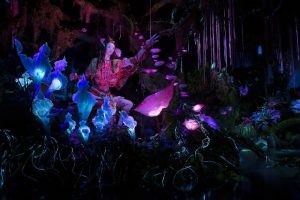 Pandora – The World of Avatar is based on the record breaking box-office hit, AVATAR, directed by Oscar winner, James Cameron who collaborated with Walt Disney Imagineering and Lightstorm Entertainment to create the entire new land. Guests are guided across the Discover River and along a winding rainforest path which will transport them to Pandora – The World of Avatar, a distant world unlike any other. In this otherworldly planet, grand in its vastness and beneath the floating mountains, are two new thrilling expedition attractions: Avatar Flight of Passage and Na’vi River Journey. The shining star of the new attraction is this 3-D expedition which transports guests on a sweeping simulated flight over Pandora’s colourful landscape, where they can experience the sensation of flying. Guests will soar around floating mountains, plunge through ancient caverns and skim across roaring oceans, before culminating in a realistic encounter with the Great Leanopteryx that boasts a 45-foot wing span. The heart-pounding adventure provides guests with a multi-sensory experience using cutting-edge technology and intricate special effects to create life like encounters such as; splashing whale-like creatures, wind blowing, roaring banshees and an encounter with a flying predator. The exhilarating flight is orchestrated to a musical score recorded by the London Symphony Orchestra. Set sail on this family-friendly river journey unlike any other. A towering totem invites guests to venture further into the grottos leading to the mystical river. At the water’s edge, guests board an eight person reed boat which will float down the river to take in the spectacular bioluminescent rainforest before guests encounter a remarkable Shaman of Songs, standing at 10 feet tall, playing an instrument and singing in the midst of a musical ceremony.